Every once in a while you get the craving for something sweet. However, if you trying to stay on the healthy highway, that can be a task. 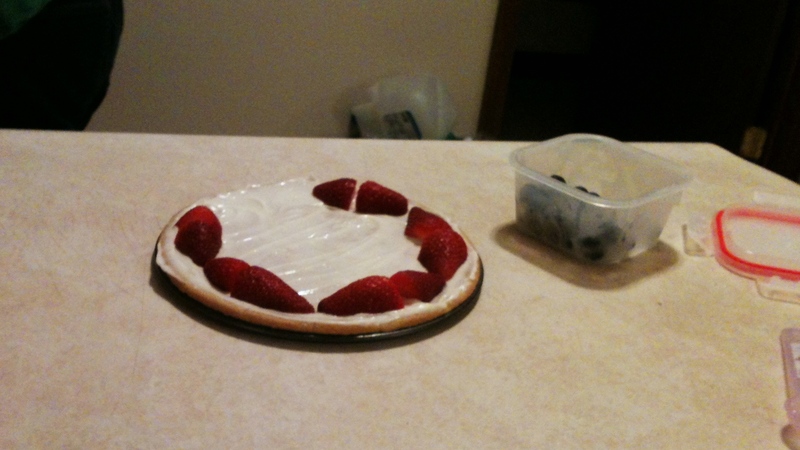 One of our favorites is fruit pizza. Now, the pizza does have some things that you dietician will not endorse, but it does has a lot of healthy fruit, and that is better than a piece of German Chocolate Cake. So we are simply minimizing the evils. Tracy is the dessert master, and the one who will be cooking this recipe for the article. 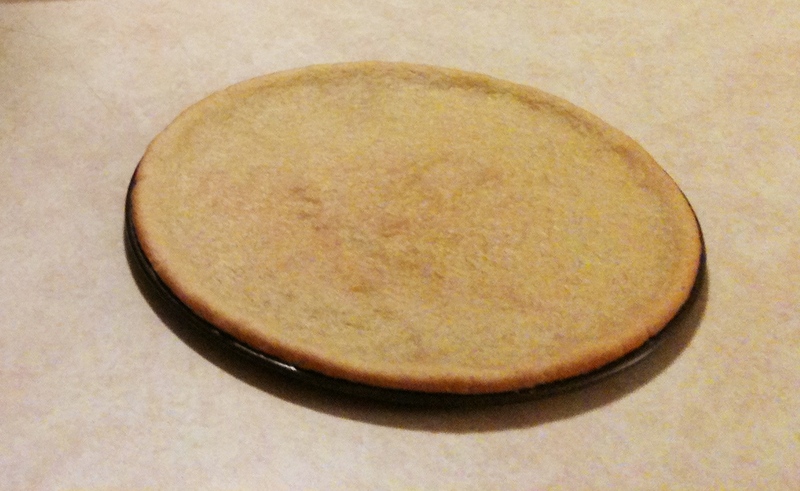 She starts with a simple sugar cookie recipe, and forms a nice crust. She baked this is a spring form pan, so that she could use the bottom to build the pizza. This can also be done on a regular cookie sheet or cake round, you will just have to plate the pizza after its finished. The filling or “sauce” is made from cream cheese and sugar. 4 oz of cream cheese 1 teaspoon of lemon juice, and 2 tablespoons of sugar works for us. However, you can use pineapple juice, crushed pineapple, flavored cream cheese, ect. You can really make this part you own. 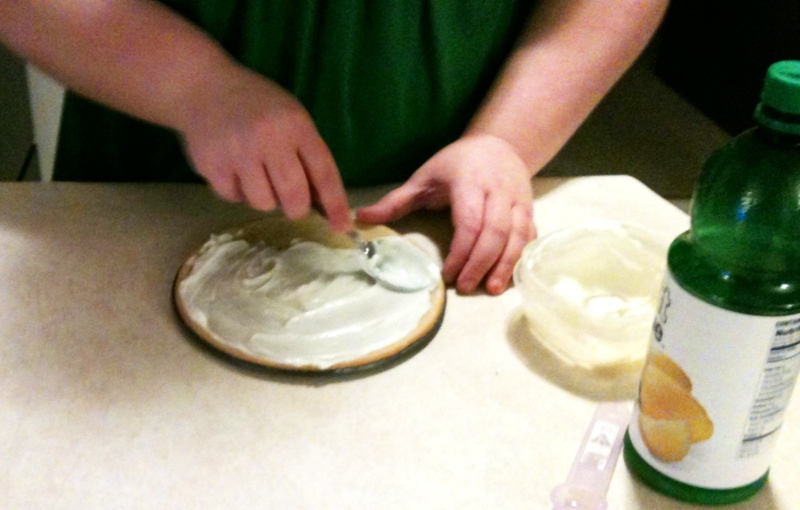 Spread the filling over the cooled crust and smooth it out to get ready for the fruit. The fruit can really be anything you can imagine. 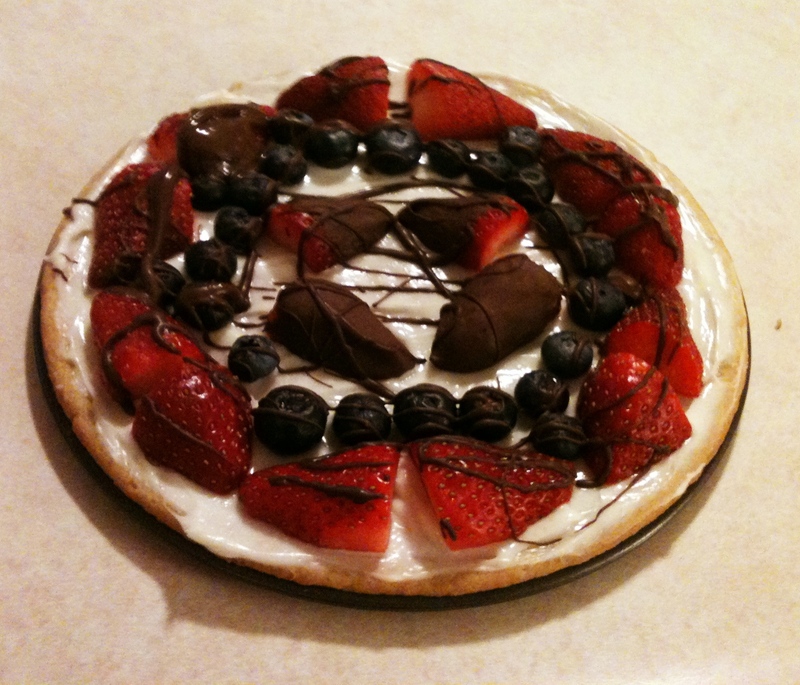 Today we used strawberries and blueberries with a little bit of dark chocolate. The dark chocolate adds calories, but are rich in antioxidants, and really go a long way with the flavor of the dish. Layer the fruit on and makes some pretty swirling patterns, or simply just make rings of fruit, It all tastes the same, the fancy stacking is just for looks. Some drizzles of the left over chocolate makes a nice effect. The entire pizza needs to hit the fridge to chill for at least 2 hours. Slice and enjoy. Remember its not completely free on any diet, but it is a dessert to not feel guilty about! Looks and sounds awesome. Definately will give it a try. Thanks for the info!